Eastern Healing Arts with the Thai perspective. 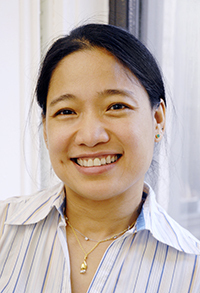 Dr. Pailin Winotaka is a New York State licensed acupuncturist and expert Chinese herbologist. A native of Thailand, she earned her Doctor of Acupuncture and Chinese Medicine and Master of Science degree in Traditional Oriental Medicine from the Pacific College of Oriental Medicine and has studied at the China Beijing International Acupuncture Training Centre in Beijing, China. Dr. Pailin is also nationally certified as a Diplomate in Acupuncture and Chinese Herbology by the National Certification Commission for Acupuncture and Oriental Medicine (NCCAOM). Dr. Pailin brings years of training and experience in the healing arts to her acupuncture practice. She received her certification from the Wat Po Traditional Medical School (Bangkok) in 1994. She has been profiled for her work in Thai acupressure in Conde Nast Traveler and Self Magazine. She is also a certified Yoga Siromani (teacher of Yoga) and has studied yoga at the Ramamani Iyengar Memorial Yoga Institute in Pune, India.